Northeastern won the Beanpot last night for the first time in 30 years, so I ended up looking up other ridiculous trophies/tournaments and, yeah, there are a lot of kitchen-focused trophies out there. 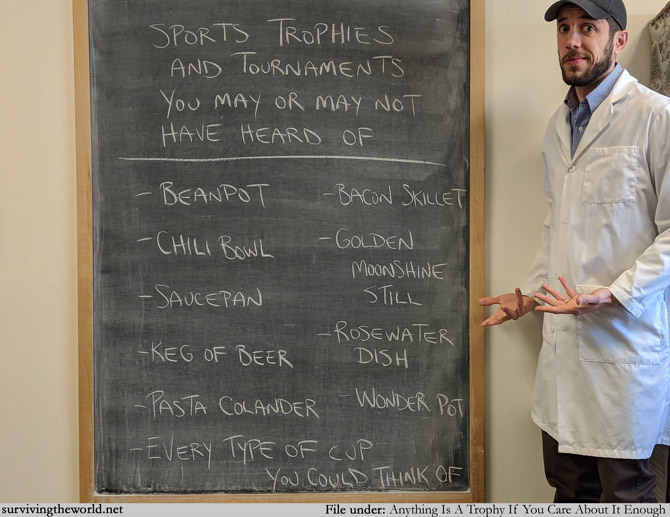 So while this comic may not be that great, the thing that I ABSOLUTELY MUST SHARE with you is a company that makes ridiculous food trophies that you can give out for whatever reason. Anyway, I'm trying to figure out how I can start awarding one of these trophies around here.